When Emilie Konig left her home in France to join the Islamic State, she left her two children behind. The former barmaid, who converted to Islam after marrying an Algerian at the age of 23, had missions to fulfill: helping to establish a pure Islamic caliphate and avenging the apostates in the West. In Syria, having divorced her abusive husband years earlier, Konig met and married an ISIS fighter and gave birth to three more children before the caliphate collapsed. Now Konig wants to come home. Currently in Kurdish custody, the 33-year-old – who was arrested in combat – appears in online videos unveiled and weeping, declaring her repentance and regret. France is having none of it. Noting that Konig was apprehended rather than having turned herself in, French officials insist that she face trial in Syria, instead. According to Agence France Presse, Konig is included on both United Nations and U.S. blacklists, which cite her propaganda videos and efforts to encourage French radicals in her homeland to execute attacks. Her lawyer, as well as the parents of other French jihadists, have called for all of those in Kurdish custody to be repatriated, arguing that France has a responsibility to its citizens. So far, the government has stood firm. In this, France has taken a different approach from most other countries, which generally have allowed women and children to return home to face charges. Many are seen as victims, rather than as perpetrators of terror. But new evidence suggests that France may be making the right call. Women may be ISIS's next weapon of choice. "Islamic State leaders in recent weeks have issued explicit directions to female returnees to prepare for new missions that include carrying out suicide attacks and training offspring to become future terrorists," the Washington Post reports. If true, this would add significantly to the challenges Western governments face with the repatriation of the children of ISIS fighters and so-called "ISIS brides" – a dilemma analyzed in a November Investigative Project on Terrorism report. If the mothers are allowed to return to their home countries, they can easily foil or unravel any efforts to deradicalize their children. Studies show that mothers are more effective in radicalizing children, terrorism expert Thomas Renard told the Washington Post. "Since the returnees are mostly young women," Renard said, "there's a possibility of still more children in the coming years, and so there's also a real possibility that these women will raise their children to accept a very radical version of Islam." This is likely to be true even if the mothers take part in so-called "deradicalization programs," a report from the New York-based Soufan Center, which addresses global security issues worldwide, said. It notes that "most returnees were never integrated in the first place... and the majority of early efforts [at deradicalization] have stuttered or come to a halt." Other obstacles stand in the way. Beginning at age 9, girls in the caliphate must be fully covered and are taught to support men in their fight for the future of Islam. Nine-year-old boys begin training for jihad in camps, where they are forced to watch, and sometimes participate in, beheadings, learn to build explosives, and are taught the virtues of martyrdom through the killing of infidels and apostates. For most of these children, it is the only world that they know. Why would they trust those values taught to – or imposed on – them by those they have been raised to see as the enemy? And yet, governments also must consider what will happen to these children if they remain in the war-torn regions of Syria and Iraq? The situation leaves countries not just with security concerns, but with what can at best be called a humanitarian dilemma. "It was my daughter's own choice to leave," the father of a Dutch convert told Dutch newspaper Trouw. "If she ever returns, she deserves her punishment ... but not the children. They are victims of the situation." He wants the government to help him bring his grandchildren, who range in age from 2 to 10 years old, to Holland. 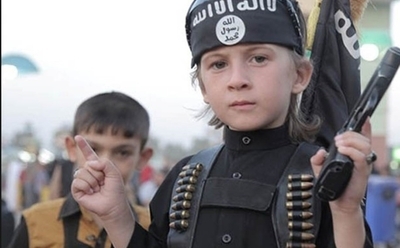 But 10-year-old children in the caliphate have already faced indoctrination. They may be victims, but they not always quite so innocent. Ironically, while Holland now has no plans to bring these children to the Netherlands, Al-Monitor reports that France brought three French-born children of ISIS fighters back home in December, leaving their mother in detention in Iraq; their father had been killed in combat. It is unclear what plans, if any, are being made for Emilie Konig's children who are in custody with her. But if France has made a wise call when it comes to Konig, it may have been less wise regarding the children. Already Germany's experience indicates that, however heartbreaking it may be both for families and officials to abandon these children to their fate in a broken Syria and Iraq, German children who return largely have remained radicalized and are not integrating well. Some 300 of the nearly 1,000 Germans who joined ISIS have repatriated, according to Deutsch Welle, including 50 women. Officials estimate that in all, a "low three-digit number' of minors will eventually make their way back, many of whom, they say, were "'brainwashed' in IS schools and are highly radicalized." Moreover, the German Federal Prosecutor's Office, echoing Renard's concerns, warns that mothers are likely to continue to raise their children with ISIS ideology. Germany has already seen how dangerous such radicalized kids can be. Three of the five Islamist attacks there in 2016, were committed by children. An additional plot by a 12-year-old boy to bomb a Christmas market was foiled. Although authorities have considered removing children from returning mothers, laws and child welfare policies stand in their way. "We look at the best interests of the child, not at the parents' beliefs," Nora Fritzsche of the Work Group For the Protection of Children and Youths in North Rhine-Westphalia told DW. Indoctrination, then, needn't necessarily come via online ISIS propaganda, or via ongoing efforts by radicals still in the region. They can get it at home, from Mom. Or from one another: in Belgium, children of the caliphate with at least one Belgian parent have an automatic right of return. Many of them, according to the Washington Post, attempt to radicalize their schoolmates. A recent New York Times op-ed by Iranian journalist Azedeh Moaveni may offer some of the insights Western governments will need most if they are to deal with this crisis – though they are not likely to find it reassuring. Even as the current caliphate collapses, she maintains, the dream of a future caliphate remains. This is as true for many Muslims in the Middle East as for those raised in the West. As a woman identified only as "Zarah" told the Washington Post, "We will bring up strong sons and daughters and tell them about life in the caliphate. Even if we hadn't been able to keep it, our children will one day get it back." Such sentiments rip open the flaws in the ways Western, and especially European, officials are treating the returnee problem. If the Netherlands puts returning mothers in prison but not their radicalized children; if France admits minors but requires adults to face trial in Kurdish-held regions of Syria and Iraq; if Germany admits both mothers and their children – what security does a borderless Europe really have? And with visa-free travel for Europeans coming to the United States, what does it mean for America? At the same time, experts note that leaving the children behind exposes them to certain radicalization, and the chance that they will join a resurgent al-Qaida or other groups, or find ways to return to Europe unnoticed. Or they may find solutions we have not yet even thought of. And so we are left with a kind of terrorism roulette. We take our chances, and hope for the best.